John and I just came back from an epic road trip. Camping in Walmart parking lots in the back of our SUV, we wound our way through the deep south, putting thousands of miles on the odometer as we made our way through 8 different states. Starting in Louisiana, we headed north to Mississippi then through Alabama, Tennessee, North Carolina, South Carolina, Georgia and finally Florida, taking in as much as we could of everything. Of course, one fine feature of the south east part of the continent is the cuisine. From Cajun and Creole, to soul food, to everything deep-fried, to fantastic sea food and BBQ a plenty, John and I were on cloud nine as we indulged in a smorgasbord of southern delights. So over the next few weeks, I am going to take you through our trip, with a food perspective of course! Of course, New Orleans is packed with Cajun and Creole food around every corner, and we had our fill. Blackened catfish, crawfish etouffee, gumbo, jambalaya and pralines were just a few of the delicacies New Orleans had to offer. An interesting thing we learned while down there is the difference between Cajun and Creole cuisine. It comes down ingredients and using what is available. Cajun is traditionally more rural as the Cajuns lived off the land, so they make use of more wild game, and different kinds of fats, using animal fat over butter. Creole is more urban and had access to more ingredients, preferring butter over animal fats and oils. John and I headed to Café du Monde to try their beignets, deep fried dough topped with an unnecessarily but delightfully large pile of icing sugar. Turns out that the world-famous Café Du Monde doesn’t make the best beignets in town. John and I gave that award to Morning Call, a café located in the main park in New Orleans. Their beignets were just a little better! Louisiana is known for its spice blends and hot sauces. 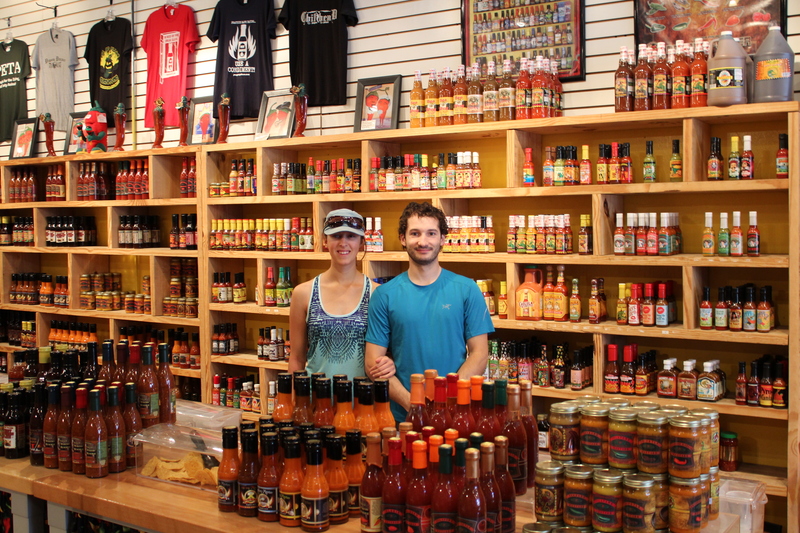 John and I have a weakness for such sauces and condiments, and lost all self-control when we went inside some of the fantastic hot sauce stores in New Orleans. Apart from just hot sauces, they boast awesome assortments of BBQ sauces, spice blends, pepper jellies, salsas, ketchups, spreads – with many of them out for sampling! As you can probably guess, John and I brought a lovely assortment home. Pictured here is a great meal John and I made upon returning from our trip. 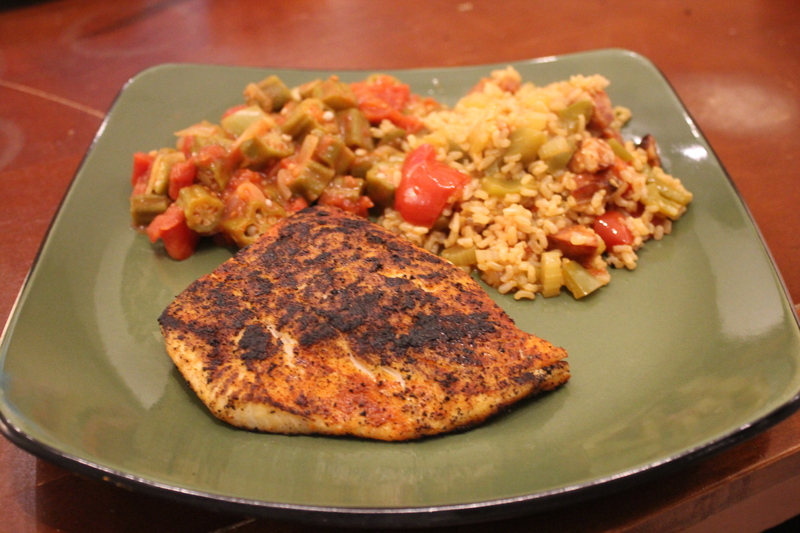 Inspired by all of the delicious food around us, we made a combo of blackened halibut, dirty rice and tomatoes and okra. This effort reassured us that yes, yes we can cook southern food here in Alberta! 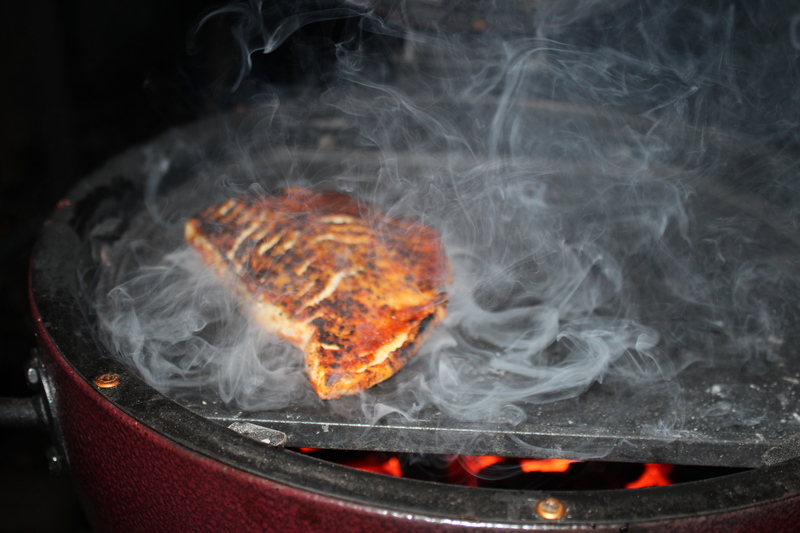 John blackened the halibut on his komado, and got the cast iron grill so hot he couldn’t even put oil on there without causing some kind of fire. It was intense, but the final product was delicious! I made the sides, the dirty rice and okra dish. Rice is a staple side for many dishes you order in New Orleans, and of course isn’t just any regular rice. It usually comes with a side of Cajun dirty rice, or some form of jambalaya. The official definition of dirty rice is rice made with chicken livers, which give the rice the colour. I am not quite that adventurous, so I made my own chicken liver-less version. 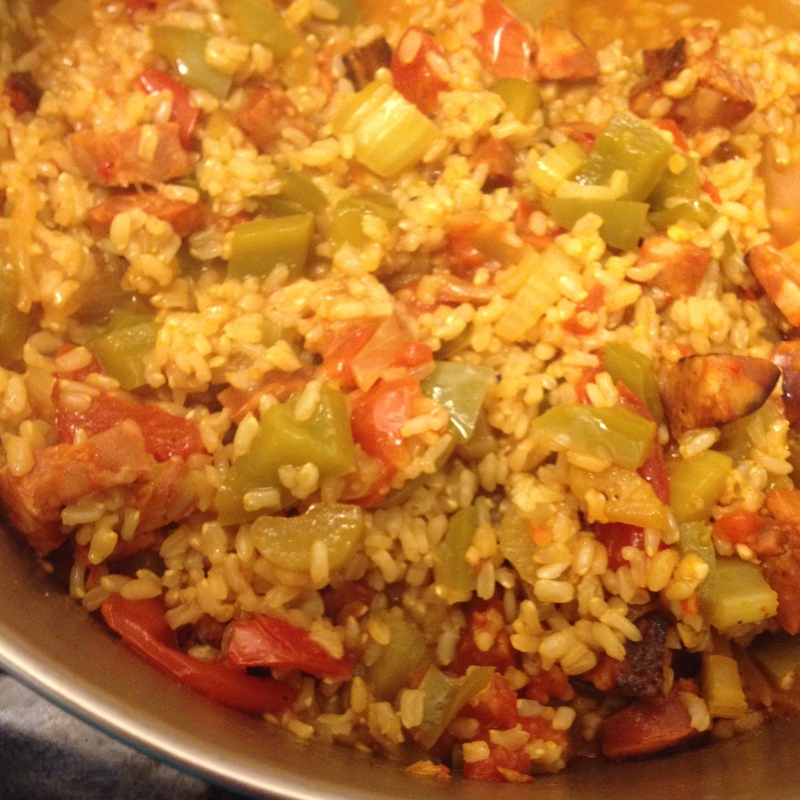 This recipe makes a great spicy side dish, and is kind of similar to a jambalaya. It features chorizo or Andouille sausage a selection of vegetables, and just a pinch of cayenne pepper. You may need to simmer the rice a bit longer than the usual cook time. Keep an eye on it! Feel free to add more vegetables and meat if you want to beef the dish up a little, and eat it as a meal. I always have these on hand in the freezer– great ingredients for spicy soup, paella, jambalaya and of course Cajun dirty rice! So stay tuned for the next phase of our trip, and the accompanying recipe! Heat pot and add sausage. Saute and then add onions. Add garlic, celery and green pepper. Then add tomato. Add cayenne. Add rice and water/broth, salt and pepper. That alligator photo is fantastic! John risked life and limb to get that one!